Hawley Water Supply Corporation offers a wide variety of convenient payment options for our customers. Simply choose the option that best suits your needs. If paying by check or money order through the mail, please send all payments with your payment coupon. To avoid late fees, please mail your payment at least five-seven business days before the due date specified on your bill. Post mark does not constitute as recieved payment. Please include your account number on your check to help speed up the processing time. 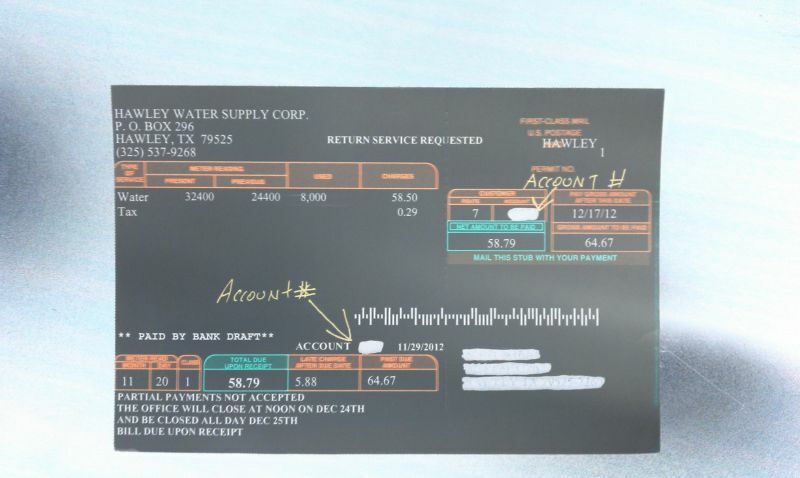 Hawley Water Supply has teamed up with Paymentus Corporation to implement an easy, convient way to pay your water bill online using Visa, Mastercard, Discover, E-check. You may also call in using a dedicated automated phone system to pay your bill. WE WILL NOT ACCEPT PAYMENTS ONLINE FOR RETURNED CHECKS! If you have a returned check, you will need to come by the office! MAKE SURE YOU HAVE THE CORRECT ACCOUNT#. WE WILL CREDIT THE ACCOUNT YOU HAVE ENTERED. Below is an image where you can find your account number on your bill.